I've got to be completely honest with you, and say… I have no idea why this cake is called "Piggy Cake". All I do know is that it's delicious, and I am forced to hide it from the Hubs or I won't get any. Normally I'm not a fan of using too many processed ingredients. 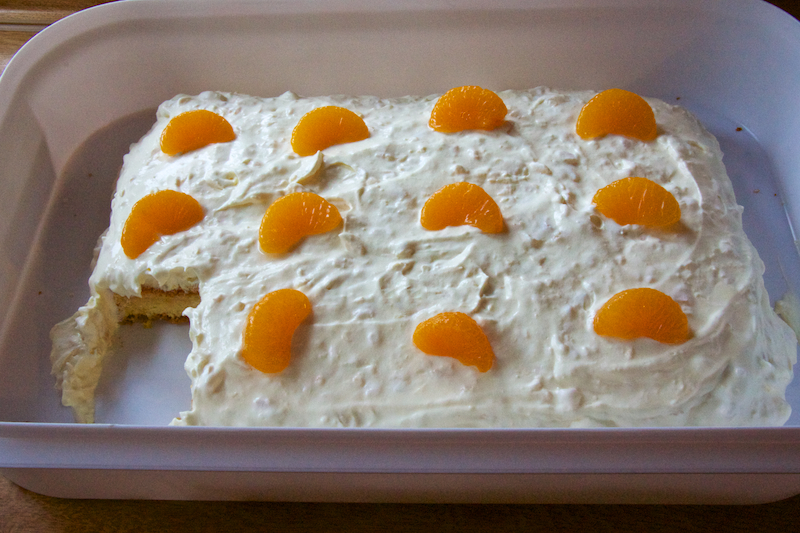 But I've been eating this cake since I was a kid (mostly at various potluck dinners), and old habits die hard. Someday I may restructure this recipe to use more natural ingredients, but for now I'm sticking with what works. Since this is only a once in a while treat, I don't feel too guilty. I love this recipe in the summertime because it's light and refreshing without being too sweet. It's also excellent for a crowd, and can be made in advance (in fact, it's better when made the day before!). Are you ready to make your own? I thought so. Now that we're living in Germany, I've had a hard time finding some of my preferred brands. I had to make a few substitutions, but it worked out ok.
Start by preheating your oven to 350 degrees. 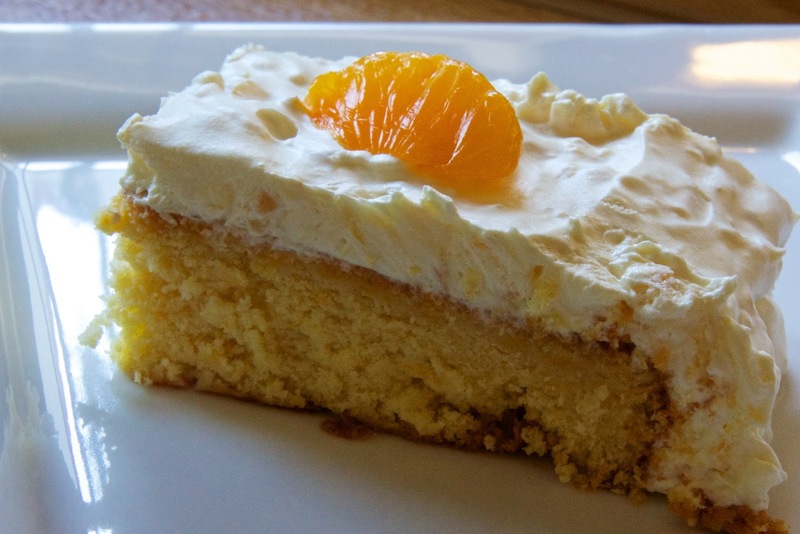 In a large bowl combine 1 box of yellow cake mix (I prefer Pillsbury, but Betty Crocker did ok), 1 stick of softened butter, 4 eggs, 1 teaspoon vanilla extract, and ½ cup mandarin orange juice (reserved from a 14 oz. can of mandarin oranges). Beat on medium speed for 4 minutes, until well combined. Then, add in the mandarin oranges and beat until the pieces are broken up and small. Pour the batter into a greased and floured 9x13 pan. Bake 25-30 minutes or until golden brown and set. Cool completely in the pan set on a wire rack. While the cake is cooling, make the icing. Drain the juice from a 20 ounce can of crushed pineapple. Blend the juice together with 1 package (4 ounces) of instant vanilla pudding mix. To that, add ½ cup powdered sugar and blend. 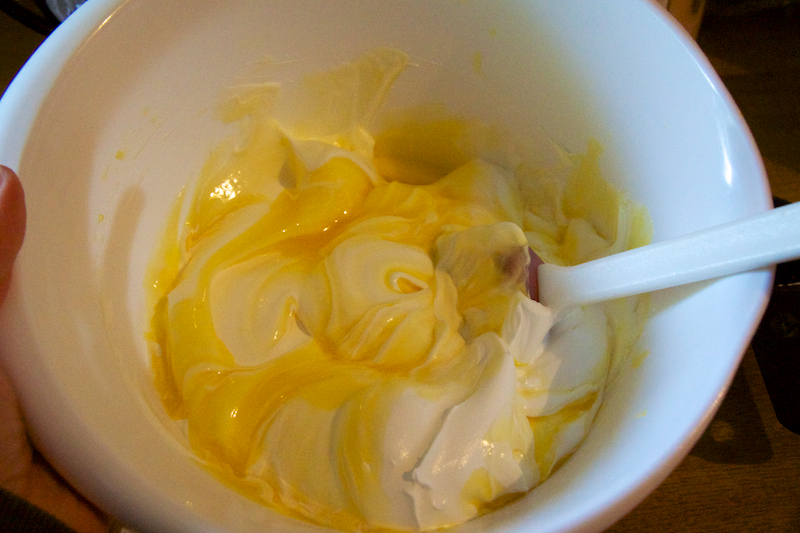 Fold in 6 ounces of Cool Whip, then stir in the crushed pineapple. Once your cake is completely cool, remove it from the pan and spread the icing over the top, allowing it to drip down the edges of the cake. Refrigerate for at least several hours. 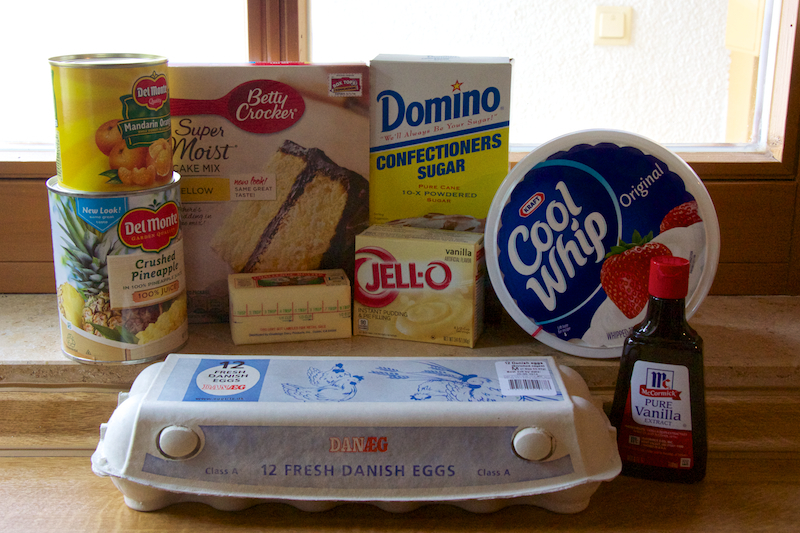 When I'm making this cake, I prefer to make it the night before. The icing sets up better after an evening in the fridge. 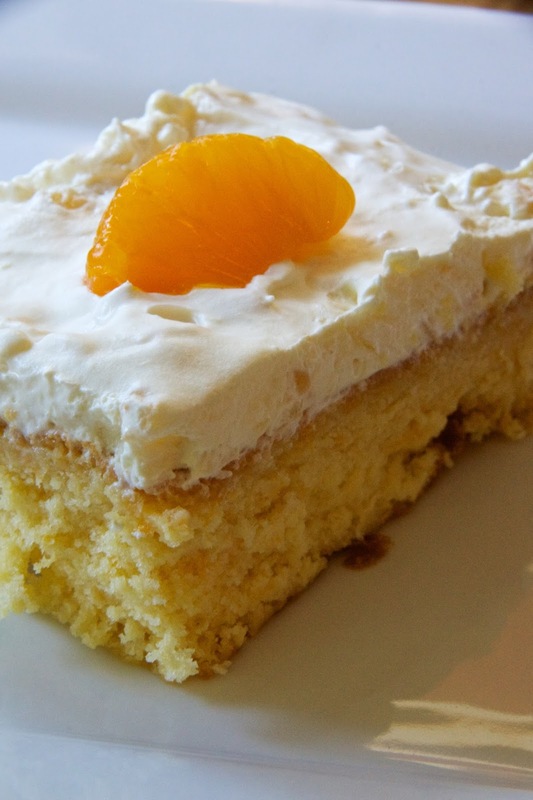 When you're ready to serve, use some extra mandarin oranges to garnish each slice of cake. Be prepared to accept compliments! Pay no attention to the missing piece of cake from that top picture!! 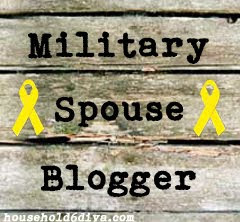 The Hubs did it, I swear. Ahem. In a large bowl, combine the cake mix, butter, ½ cup of the reserved mandarin orange juice, eggs, and vanilla. 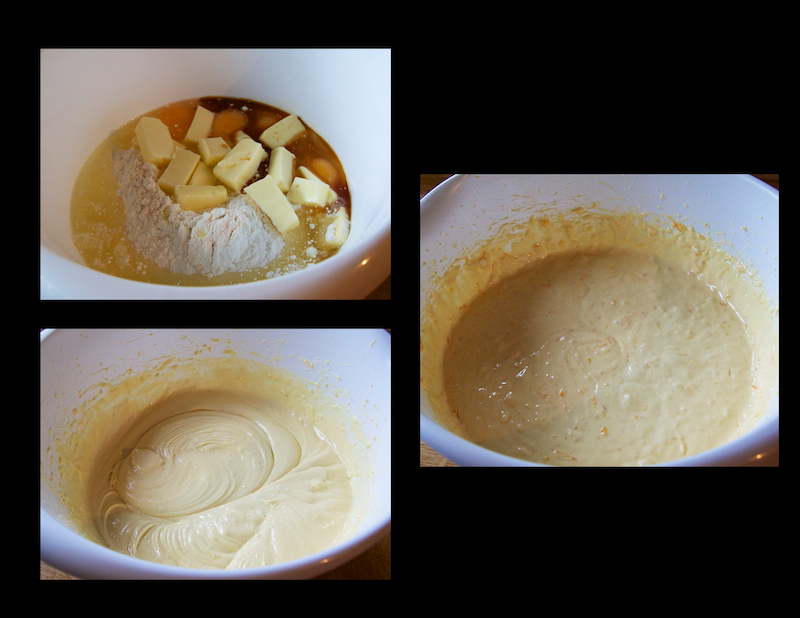 Beat 4 minutes on medium-high speed, then add the drained oranges and beat again, until the pieces are broken up and small. Pour the batter into a greased and floured 9x13 pan. Bake 25-30 minutes or until golden brown and set. Remove cake from the oven and cool completely in the pan set on a wire rack. Turn the cake onto a serving plate before icing. Once the cake is cool, blend the juice from the drained pineapples with the vanilla pudding mix. Add the powdered sugar and blend, then fold in the whipped cream topping. Stir in the drained pineapple. Spread this mix onto the cooled cake and refrigerate for several hours or overnight. Once ready to serve, garnish each piece with a mandarin orange slice. Store leftovers in the fridge.